http://host:port/servletContextPath/users GET Retrieves the user list. http://host:port/servletContextPath/users POST Creates a new user. http://host:port/servletContextPath/users/12 GET Retrieves user with id = 12.
http://host:port/servletContextPath/users/12 PUT Updates user with id = 12.
http://host:port/servletContextPath/users/12 DELETE Deletes user with id = 12. Configure Spring. 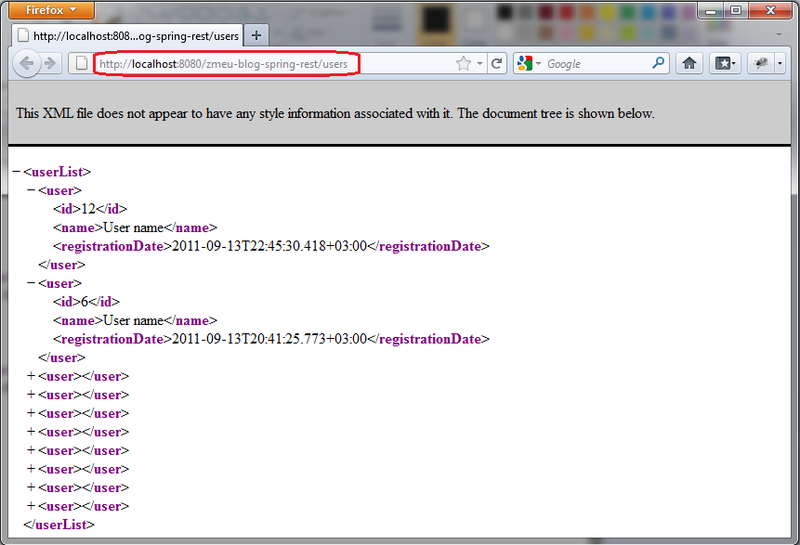 As you already observed, we used annotations all over, so Spring configuration is minimal (applicationContext.xml). Configure web application. Our web.xml configuration is also minimal. You can see that we only registered the Spring MVC DispatcherServlet and added the Log4jConfigListener for logging. Build the project. From command line, run mvn clean install command from the directory where pom.xml is located. Build must be successful. Deploy the resulted web application. Run mvn tomcat:run from command line from the same location. Test and consume RESTful services. Below you can see the class that is testing our RESTful services. I used TestNG testing framework (JUnit can be used as well). Tests that are shown below can be used as an example of how to consume RESTful services. All tests are disabled by default @Test(enabled = false). You have to enable them. This is done in order to skip tests execution at the build time. Tests should be run only after deploying the web application. In order to execute the tests, run mvn test command. Taking an arbitrary Java object returned from a controller handler method and converting it into a client-pleasing representation is a job for one of Spring’s HTTP message converters. Spring comes with a variety of message converters: XML, JSON, Atom, RSS, binary, String, etc (see all classes implementing HttpMessageConverter). IMPORTANT: Although Spring 3 supports validation of arguments and return types for Spring MVC controllers using JSR-303 (Bean validation), it doesn’t work in case of RESTful controllers (see also bugs SPR-6709 and SPR-6928). A Comparison of Spring MVC and JAX-RS (from InfoQ). Using Spring 3.0 MVC for RESTful web services (describes some existing issues along with solutions). Hi would you be able to provide an example how to use RestTemplate to POST an ArrayList , in this case how do you POST your UserList object using RestTemplate POST method? Below is a response to Uma Ravi question: "Both Get and Put have same urls. How does the request get differentiated and mapped. Please explain on this." HTTP defines methods (sometimes referred to as verbs) to indicate the desired action to be performed on the identified resource. In our case the resource (User with id=12), which is identified by a URL (http://host:port/servletContextPath/users/12) supports 3 types of actions identified by corresponding HTTP methods (GET, PUT, DELETE). Although URL is the same, the actions are different. It works same way as HttpServlet. You map the servlet to a URL path inside web.xml and then implement the actions which you want to support by using doGet(), doPost(), doPut(), doDelete(), etc. methods. There is no database or hardcoded data in your code. I made the screenshot after running UserControllerTest few times. UserServiceImpl uses a simple map for persistence, so all the created users stays there, in memory. When I am running the Unit Test , It's showing the following error . Note : I have changed the servletContextPath as I tried with the existing one showing the same error . Tests run: 6, Failures: 6, Errors: 0, Skipped: 0, Time elapsed: 1.623 sec <<< FAILURE! Could u plz tell me why this 404 exception happening ... ? I will appreciate your time . It will show you what is the actual servletContextPath. By default the maven tomcat plugin uses the artifactId for your pom.xml. I have placed my applicationContext.xml in WEB-INF, web.xml in WEB-INF and log4j.properties in resources. There you will see exactly where all the files should be placed. Hey, could you tell me how can i run the tests, or how to populate the map with users, 'cause for now i've tried all the possible paths and none of them create any new users. Run steps 9, 10 and 11. In step 11 run the UserControllerTest.read() test (you will have to enable it first, check the enabled attribute of @Test). The test can be run from your IDE, just make sure you have the TestNG plugin installed. You can use JUnit instead of TestNG, just replace the TestNG annotations with the JUnit one. The read() test will create and then read an user. After you will be able to read it through browser. Check step 12 and screenshots.